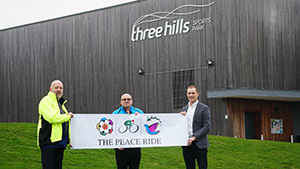 Shepway Sports Trust will be facilitating The Three Hills Sports Park’s Peace Field Project twinning ceremony. Their peace pitch will be in the memory of Folkestone born Walter Tull, the first black professional football and the first black captain to serve in the British Army in WW1. The Peace Pitch will be twinned with Flanders Peace Field, Mesen, Belgium, site of The First World War 1914 Christmas Truces. To help launch the twinning event Paul Cooper (left), Director of The NCFA and Anthony Woods (centre), Forget Never, Sacrifice & Legacy, presented Laurence Hickmott (right), CEO, Shepway Sports Trust a commemorative Peace Poppy Football during their sponsored Peace cycle Ride from The University of Kent’s Peace Pitch, Canterbury to The Last Post, Menin Gate, Ypres, Belgium. The Peace Pitch in Folkestone. 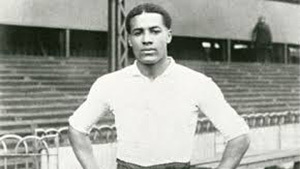 The birth place of Walter Tull one of the first black professional footballers who served in the First World War is the inspiration behind The Peace Pitch in Folkestone. 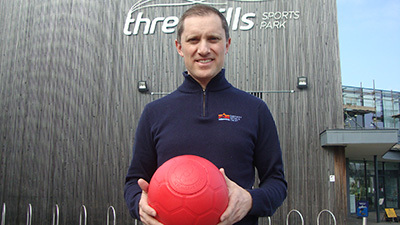 To commemorate the prestigious event – Shepway Sports Trust will facilitate football for free at the Three Hills Sports Park. A date and details will be confirmed in the coming weeks.